Every evening, as dusk descends, it's time for the Ganga Aarti to be performed at the three holy cities of Haridwar, Rishikesh, and Varanasi in India. It's a very powerful and uplifting spiritual ritual. But what's its meaning and how can you see it? What Is the Ganga Aarti? 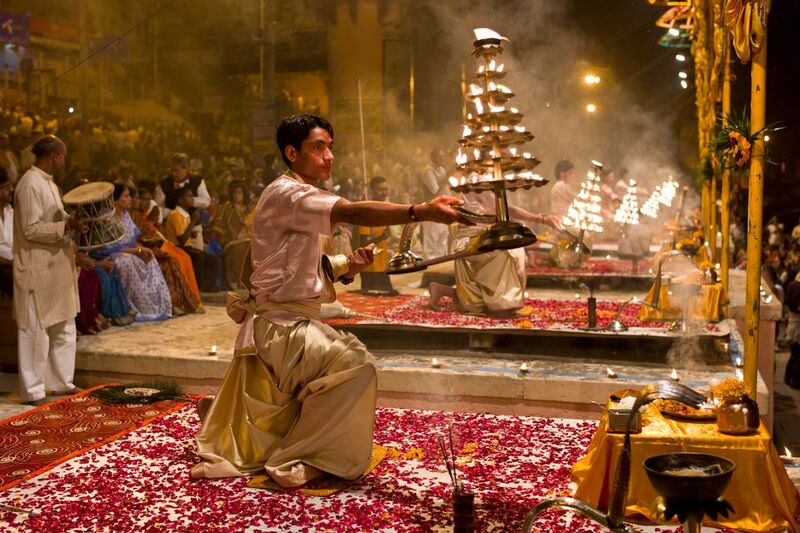 An aarti is a devotional ritual that uses fire as an offering. It's usually made in the form of a lit lamp, and in the case of the Ganges River, a small diya with a candle and flowers that's floated down the river. 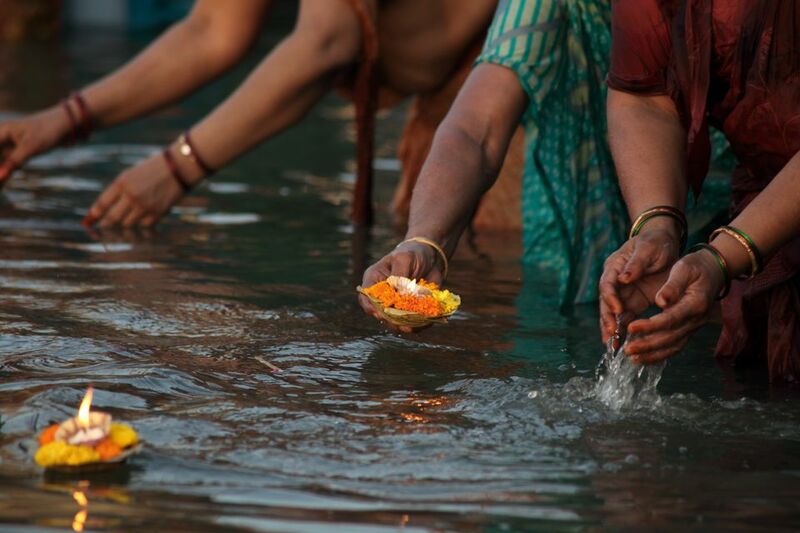 The offering is made to the Goddess Ganga, also affectionately referred to as Maa Ganga, goddess of the holiest river in India. The aarti takes on special significance on the auspicious occasion of Ganga Dussehra (usually in May each year), when Maa Ganga is believed to have descended from heaven to earth. How Is the Ganga Aarti Performed? The aarti is carried out facing the river. The lamps are lit and circled around by the pandits (Hindu priests) in a clockwise manner, accompanied by changing or songs in praise of Mother Ganga. The idea is that the lamps acquire the power of the deity. After the ritual is complete, devotees will cup their hands over the flame and raise their palms to their forehead in order to get the Goddess's purification and blessing. Where Is the Ganga Aarti Performed? As mentioned above, the Ganga Aarti happens every evening (rain, hail, or shine!) on the banks of the Ganges River in Haridwar, Rishikesh, and Varanasi. However, the ceremony is very different in each of these places. Read on to find out about the Ganga Aarti in each place. The Haridwar Ganga Aarti is held at Hari-ki-Pauri ghat. The name of this famous ghat literally means "Feet of the Lord". A footprint on a stone wall there is said to belong to Lord Vishnu. In terms of spiritual importance, Hari-ki-Pauri is considered to be equivalent to Dashashwamedh Ghat where the aarti takes place in Varanasi. Legend has it that some nectar (amrit) landed there after falling from a pot carried by the celestial bird Garuda. The Ganga Aarti at Haridwar is possibly the most interactive of the three Ganga Aartis in India and will have the deepest appeal to pilgrims, particularly those with an Indian background. It has a location of spiritual significance the same as the Varanasi Ganga Aarti but isn't as flamboyant and staged. Yet, it's quite the spiritual circus: people, pandits, babas, idols of various gods, loudspeakers, clanging bells, singing, incense, flowers, and flames! All this combines to create a very sensory experience. Some people say that it's too commercial, crowded, and noisy. However, I found it to be one of the most awe-inspiring things I've ever witnessed in India. There are a couple of options for attending the aarti, depending on how you want to see it and what you're prepared to pay. It's possible just to sit on the steps and watch it from a distance, like most people. However, if you're staying in a decent hotel such as the Haveli Hari Ganga, a guide will most probably be available to take you to the aarti. This way, you'll be able to get in amongst the action and participate in it. You'll be blessed by a pandit, and ushered to the front steps of the ghat, right where the lamps are circled. If you're fortunate, you'll even be able to hold one of the lamps. The evocative chanting coupled with the billowing flames, and the holy water lapping at your feet, makes it particularly moving and unforgettable. You can really immerse yourself in this ancient ritual. It's highly recommended. Of course, at the end, when the pandits ask for money, it can be a rude shock. They're known to be greedy, and if you're a foreigner they've been known to ask for thousands of rupees. It's definitely not necessary to give this much though. An amount of 501 rupees (for a couple) is more than sufficient if you're feeling generous. Tip: If you're a woman, do take a scarf to cover your head for religious reasons. Don't worry too much if you don't have one though. You'll be issued with a thread to perform the same function. The most well known Ganga Aarti in Rishikesh is held on the banks of the river at Parmarth Niketan ashram. It's a much more intimate and relaxed affair than the aartis at Haridwar and Varanasi and is devoid of the theatrics as well. Many people prefer it for these reasons. They find it much more spiritual. Instead of being performed by pandits, the Ganga Aarti at Parmarth Niketan is organized and performed by ashram residents, particularly the children who are studying the Vedas there. The ceremony commences with the singing of bhajans (devotional songs), prayers, and a hawan (a purifying and sacred ritual that takes place around a fire, with the offerings made to Agni, the fire god). The lamps are lit and the aarti occurs as the final part of the ceremony. The children sing along with the spiritual head of the ashram, in sweet, haunting voices. A huge statue of Lord Shiva overlooks the proceedings. Everyone is welcome to attend the Ganga Aarti at Parmarth Niketan. Do arrive early if you want to get a seat on the steps close to the action. It can be difficult to see otherwise. Shoes must be removed but you can securely store them for free at the entrance. The Varanasi Ganga Aarti takes place every sunset at holy Dasaswamedh Ghat, near Kashi Vishwanath Temple. It differs from the aartis at Haridwar and Rishikesh in that it's a highly choreographed ceremony. Although a spectacular must-see, some people consider it to be too much of an artificial and showy extravaganza to have a lot of meaning in a spiritual context. The aarti is performed on a stage by a group of young pandits, all draped in saffron-colored robes with their puja plates spread out before them. It commences with the blowing of a conch shell, and continues with the waving of incense sticks in elaborate patterns and circling of large flaming lamps that create a bright hue against the darkened sky. The movement of the lamps, held in the pandits' hands, is tightly synchronizing to the rhythmic chants of hymns and clang of cymbals. The heady scent of sandalwood thickly permeates the air. People start arriving very early (as early as 5 p.m.) in order to get a good position for viewing the aarti. A novel and effective way of seeing it is by boat from the river. Alternatively, many shops in the vicinity hire their balconies out to tourists. A maha aarti (great aarti) takes place on a particularly elaborate scale in Varanasi near the end of each year on Kartik Purnima.